Eight sections with over 500 pages of sliding door hardware, door handles and locks, hinges, door accessories, glass door fittings, bathroom accessories and much more. Häfele is a company that has always been about the details—whether it be the design and function of a seemingly simple connector or a massive sliding door system used in luxury homes and commercial projects. 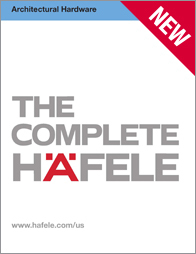 Specifiers and designers will find all those details and more in latest edition of The Complete Häfele for Architectural Hardware, available now. This 500+ page catalog is packed with everything those in the project business need to add the innovation and functionality Häfele is known for the world over. Used every day by architects, designers, builders and installers, The Complete Häfele for Architectural Hardwareis where all your projects begin. The catalog can be viewed digitally or ordered in print here.